Prime factorization: 7 is prime. The exponent of prime number 7 is 1. Adding 1 to that exponent we get (1 + 1) = 2. Therefore 7 has exactly 2 factors. 7 has no square factors that allow its square root to be simplified. √7 ≈ 2.64575. How do we know that 7 is a prime number? If 7 were not a prime number, then it would be divisible by at least one prime number less than or equal to √7 ≈ 2.6. Since 7 cannot be divided evenly by 2, we know that 7 is a prime number. 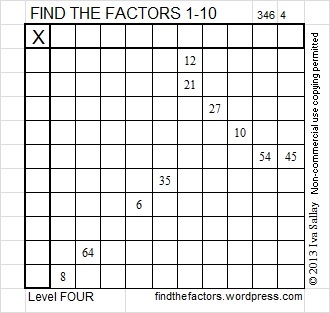 When 7 is a clue in the FIND THE FACTORS puzzles, one factor will be 7 and the other will be 1. Spaghetti and Meatballs for All! by Marilyn Burns is a delightful story, the kind that children enjoy hearing over and over again. I work at a Leader in Me school, where we promote the Seven Habits. I used this book when I taught about habit 4, think win-win. When we think win-win, we do not allow someone to “step on us’ to give them a win. Mrs. Comfort’s relatives stepped on her over and over again, and they didn’t even realize it. Finally, she cried, “I give up!” and planted herself on a chair. She definitely felt like she was losing. The class listened to the story intently trying to identify places where the Seven Habits were used or could have been used. We had a great discussion afterward. Also since the book did not use the words, “area” or “perimeter” at all, the class hardly realized that the story was also about those concepts. When we followed the suggestions at the back of the book, the class was able to learn about perimeter and area as we had a great discussion about those topics as well.